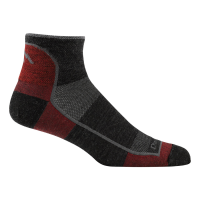 Offering lightweight construction that's made for year-round comfort, Bolt socks for kids have the same great quality and fit you expect from Darn Tough. With lightweight construction that makes them ideal for year-round comfort, Camo kids' socks have the same great quality and fit you expect from Darn Tough. Kids will enjoy a day on America the Beautiful's majestic mountains in the patriotic Captain Stripes Jr. Over-the-Calf Light socks with targeted padding in the shin and under foot. Dot and Stripe kids' socks have the same great quality and fit you expect from Darn Tough. Their lightweight construction makes them ideal for year-round comfort. Happy feet equals happy campers. Emoticons socks for kids have the same great quality and fit you expect from Darn Tough, and the lightweight construction makes them ideal for year-round comfort. 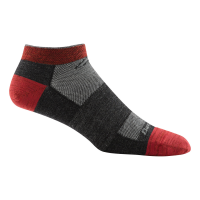 With customized comfort pads to protect common boot pressure points, the men's Darn Tough Padded Function 5 Over-the-Calf Cushion socks provide the comfort you need to play all day on the mountain.